#2552- BLM uses the name of the “Complex” when doing a roundup, not usually the Herd Management Area (HMA). “Nut Mountain” is part of the “High Rock” Complex. 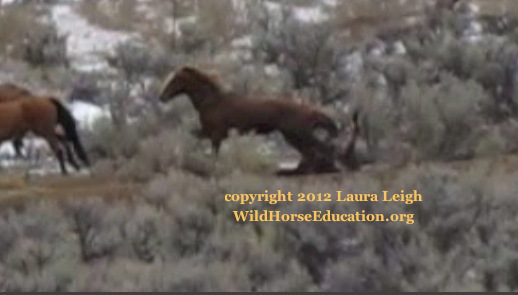 The BLM marks this horse as “captured” on the 17th of October 2011. 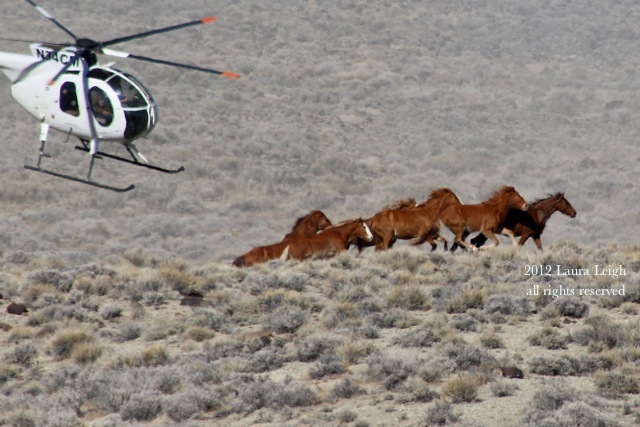 On this day BLM captured 26 wild horses at the Salt Grass Well trap. BLM has this mare aged as “3.” It’s now May of 2014. So this girl has spent her life at Litchfield. 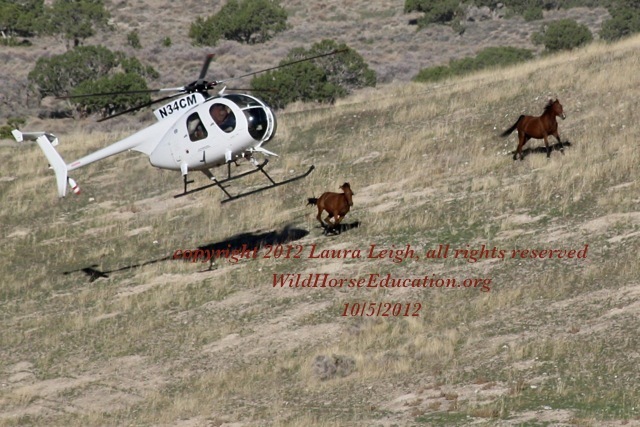 #2598, BLM has listed as a 3 year old mare from High Rock captured on 10/26/2011. Again we have a wild horses captured as a very tiny baby and spent the majority of it’s life at Litchfield. The image above is from that day. We have video on our youtube channel of various days at High Rock. #2670 Another 3 year old from High Rock. The mare is another captured as a baby and has spent her life in Litchfield. 69 horses were reported captured on this day (where they said they were moving the trap but did not). #2878 is reported from Fox Hog. Fox Hog is also part of the High Rock Complex. This mare was captured as a baby reportedly on 11/1 and spent her life at Litchfield. She is from the Texas Creek area of Fox Hog. #3297 for some reason identified as a three year old “filly” and all the others from the same area are labeled as three year old mares. But she is from High Rock as well and has been at Litchfield all her life. On the day she was captured a sorrel mare ran into fence at at the trap site and broke her neck and died. A stud being prepped for release at the temporary holding site broke his leg and had to be euthanized. #3364 is yet another High Rock 3 year old from the Fox Hog HMA. 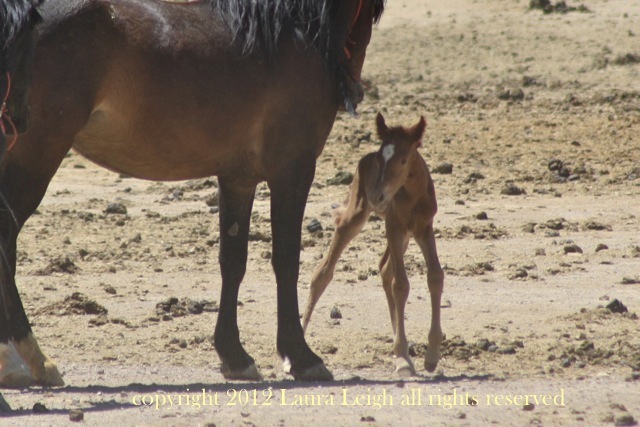 A few days before her capture BLM reported a foal broke it’s neck and died. I like the “escape” videos. On our youtube channel there are more High Rock Videos. Now this next filly is VERY interesting and illustrates some serious issues with BLM record keeping during capture and at facilities. Or simply editing for typos. #3944, #3965 and #3966 are from an area in CA that had an “off HMA” removal in 2012. These horses are listed as 2-3 years old and were all captured as babies. The Red Rock Lakes HMA is located about 10 miles east of Macdoel, CA in northern Siskiyou County, California. It is entirely isolated from any other wild horse area. This HMA contains 17,000 acres on Mahogany Mountain. This area has a estimated AML of 25 wild horses. There is no “gather” update page by BLM on this removal. We did not know about it. We were dealing, with issues at Sheldon, another roundup done in secrecy by USFWS around the same time. #3986, #3997, #4007, #4045, #4047, #4059, #4061, # 4065, #4067, #4302 and #4322 are all from the Owyhee Complex. All of these horses were taken to PVC and then transferred to Litchfield. Regardless of what it says on the BLM adoption page ” from the Little Owyhee Herd Area, California,” Little Owyhee is one of 5 HMA’s in the Owyhee Complex in North central NV and does not even border the state of California. All of the horses listed are reported to have been captured from Dec 10th-Dec. 19th. On December 10th a 3 year-old stud euthanized due to a pre-existing physical defect of the leg which had also caused club footedness. BLM said a 9 year old stud broke it’s leg prior to the gather and was euthanized on 12/15. On 12/14 a stud was also euthanized (after living to be ten years old and running those cliffs from the chopper) for a “defect” of being club footed. On the 20th a mare was euthanized for a rear broken leg. At the trap the weather was bitter. Wild horses were run up and down hillsides and near very rocky cliffs. There was a ditch at the trap and several horses stumbled. A baby fell and was run over. Many of these horses we have documentation of both capture and holding. We will do a more extensive search if time allows. All of these horses deserve a loving home that understands all they have been through. 2379 is a black, 4 year old mare with date of capture listed as 8/1/2010 with “born in a holding facility.” Her mother was taken from McGavin Peak. McGavin Peak is managed by the Forest Service. 2419 is a 5 year old mare from the Red Rocks Lakes CA. The Red Rock Lakes HMA is located about 10 miles east of Macdoel, CA in northern Siskiyou County, California. It is entirely isolated from any other wild horse area. This HMA contains 17,000 acres on Mahogany Mountain. This area has a estimated AML of 25 wild horses. There is no “gather” update page by BLM on this removal. 3225 is a gorgeous cremello 5 year old mare. She was captured as a baby near Ely NV (Eastern NV) from the Clover Mountains in 2009 and has spent her life in holding. It was a nuisance removal to satisfy complaints of landowners. 3338 is a bay mare captured in 2009 as a baby from Seaman. In 2008/2009 BLM created a decision record to zero out the HMA and designate it an “HA,” or herd area not managed for wild horses. It is of note that the livestock allotments for cattle are still in use. 4575 is one of those I can not explain. I can not explain why BLM has a 7 year old gelding with a date of capture reported as 1/25/14 from Antelope Valley for adoption at Ridgecrest. There was no removal in 2014 at Antelope. There was a removal in Jan/Feb 2011 (but called Antelope Complex) and one in 2012 (called Antelope Valley) but that one was in October. So I don’t know why the date says 2014. The roundup in 2011 was intense with heavily pregnant mares being run, a horse fell down a cliff on his face and was later seen in the mud pit of Butterfield in Utah bearing an open wound. This guy has a story somewhere… gonna look for him. Stone Cabin in 2012. The first removal of wild horses ever happened at Stone Cabin with Velma Johnson present to oversee. The next 14 horses are listed as coming from Stone Cabin/Saulsbury. So the gather update page is for the COMPLEX. I was there with Dave Philipps from ProPublica and the stats on “public observers” are incorrect. 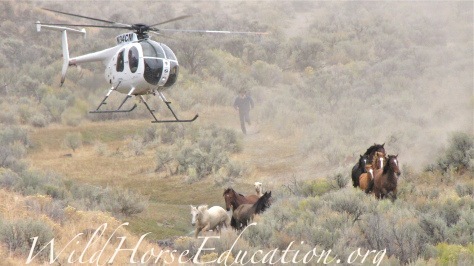 (Dave Philipps is the reporter that we worked with on the 1700 wild horses that went to one killbuyer). You can read about Stone Cabin in 2012 here. Pictures and background at this link. 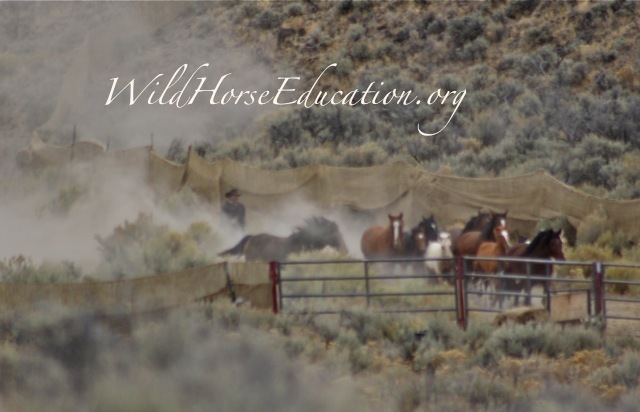 http://wildhorseeducation.org/roundups/roundups-2012/stone-cabin-2012/ There was also a trapsite adoption at this roundup. Of note is not one of them has a bid. The “Stone Cabin Grey” was one of the horses Velma Johnson was particularly fond of. Wild horses kept at this facility create a HUGE problem. In 2010 BLM closed the doors to the facility because of “image issues” as public outrage grew from conditions in the facility. They then offered “twice yearly tours” of the facility that were cancelled after the October 2012 tour. No visitors are allowed at the facility. Babies are being born in there now from the Blue Wing wild horses captured last summer and no one can see or adopt them onsite… or at all. Last our of Broken Arrow. #0870, #1017 and #1111 are all from the Calico roundup of 2009/2010 when the very first horses went into that facility. The ranges listed are all part of the Calico Complex. 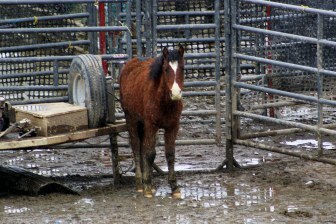 The images of the Calico wild horses in the facility and the lack of basic care caused the facility to close it’s doors. The Calico Complex was the first large scale roundup consistently covered by advocates and images shared over social media. All three of these horses have spent their entire lives in that facility. #1908 is likely the baby of a Calico mare born in that facility. When weaned the care was not taken to note the mothers HMA. #2076 is an appy mare born in the facility. Most likely a baby from Calico. #2573 was born in a holding facility that does not note mares foals are taken from and denies public access. The only way to know this horses story would be if she could speak. #2638 has a rather unfortunate typo. This 4 year old “born in a holding facility outside the public view” has a “capture date of 12/31/1969…. 1969 pre-dates the Wild Free Roaming Horses and Burros Act. #2735 and #2756 are mares unfortunate enough to be born in a facility that does not care enough to even get the tag numbers of the moms. Again… this facility is off limits and they are now no more than a number and a picture…. and have no bids. #2796 and #2797 (skip over #2868 with that “born in a blackhole of secrecy and lack of record keeping that is Fallon”) #2893 and #2907 are from Callaghan. See the description under the picture above. #2953 is a “born in a holding facility” palomino cutie that is most likely from a Calico mare. She was passed over in previous adoption events. #2996, #2997 and #2998 are both “born in the facility” but have a “capture date of 5/11/10. As there are no roundups in May that must be an estimate of birth. These are most likely from Calico mares. The consecutive numbers on these horses let you know that they have been together a long time…. all their hidden lives. #3090, #3457, #3577 are from Callaghan Complex. New Pass/ Ravenswood, Rocky hills, Callaghan. See link below picture above. #6769 was taken from the Tobin range in 2009 and has spent her entire life going from facility to facility. #7858 is from the intense winter roundup at Pancake in NV. ~~~Made it this far. Will do Palomino Valley and the burros in the next installment. It is extremely frustrating to look at the faces of all of these wild horses. 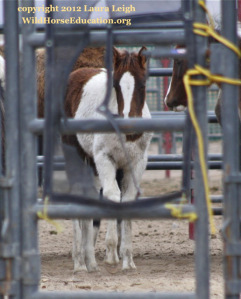 In the last four years we have literally witnessed thousands of wild horses lose everything. Many of the roundups are extremely frustrating due to access issues or those surrounding treatment. The Broken Arrow facility on Indian Lakes Rd in Fallon NV (that BLM changes the name they reference the facility by every few years) is extremely irritating as wild horses are born there and ship out sight unseen over and over again or live lives without a chance for adoption (unless they happen to be listed on the internet by those at the facility). We will try to update with as much info as possible but issues are intensifying on the range daily and time is limiting. Please visit our website: http://WildHorseEducation.org and help us continue our work.